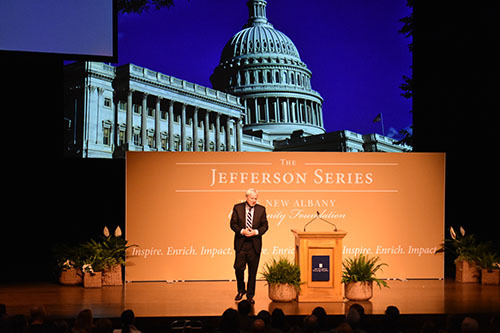 The New Albany Community Foundation presented Chris Matthews, New York Times bestselling author and host of MSNBC’s Hardball, as part of this season’s Jefferson Series lectures. Matthews spoke to central Ohio students in the afternoon and followed with an engaging evening lecture that included such lively audience participation that organizers needed to cut off questions. Matthews began the sold-out evening lecture saying “My life has been learning,” and he spent the next 75 minutes sharing his experiences and opinions on topics such as the Kennedys, his time as chief of staff for legendary Speaker of the House Tip O’Neill and as a presidential speechwriter, the leaders he respects most in Washington today and the future direction of the country. He also reflected on some of his most memorable career moments. “There was nothing better than flying around the country on Air Force One and writing words that you know will come out of the president’s mouth at the next stop,” said Matthews.